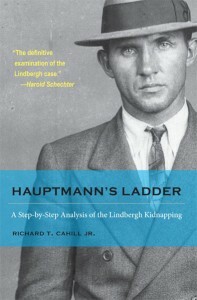 If you want an exhaustive and meticulously researched account of the Lindbergh baby kidnapping the Hauptmann’s Ladder is THE book to read. If you’re not familiar with the case (it’s probably one of the most notorious and sensational crimes in American history), in 1932, the infant son of American aviation hero Charles Lindbergh was kidnapped from the nursery on the second floor of the family’s New Jersey home. A ransom note for $50,000 was found on window sill. (A second ransom note for $70,000 came days later). The body of the baby, Charles Jr., was found a few months later. A German immigrant Bruno Hauptmann was arrested for extortion and later charged with the murder of Charles Jr. He was executed in the electric chair in 1936. The significance of the book’s title is a reference to the ladder that was used to gain access to the child’s bedroom. The author Richard T. Cahill Jr has researched the case for over 20 years. It is a case where there are theories that Hauptmann was innocent and the victim of corruption and a cover-up. However Cahill presents the cold, hard facts of the case and draws upon documentary evidence, even including evidence and information that has never before been revealed. The Lindbergh case is fascinating, frightening and an important part of America’s social history. This book is a very intelligent read that transcends true crime.